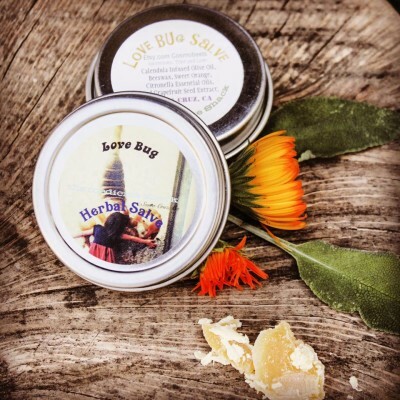 This is my Love Bug Salve! It’s a great salve for all of you highly active and outdoor adventurers, Whom Will be Camping and Spending much time Around Bugs. It is has multiple uses and has sure come in handy in my first aid kit and household and car. We spend much of our time as a family Camping and outdoors exposing our family to many mosquitoes and bugs. My daughter has major skin reactions Mosquitoes. So I wanting to protect her while keeping her exploring what we all love most: NATURE – I created this salve we all Call LOVE BUG. It has a beeswax and Calendula olive oil Base. Calendula is used in everything from lip balms, tinctures, wound washes and oils because of it is safe for children and animals. It is wonderfully gentle and powerful. 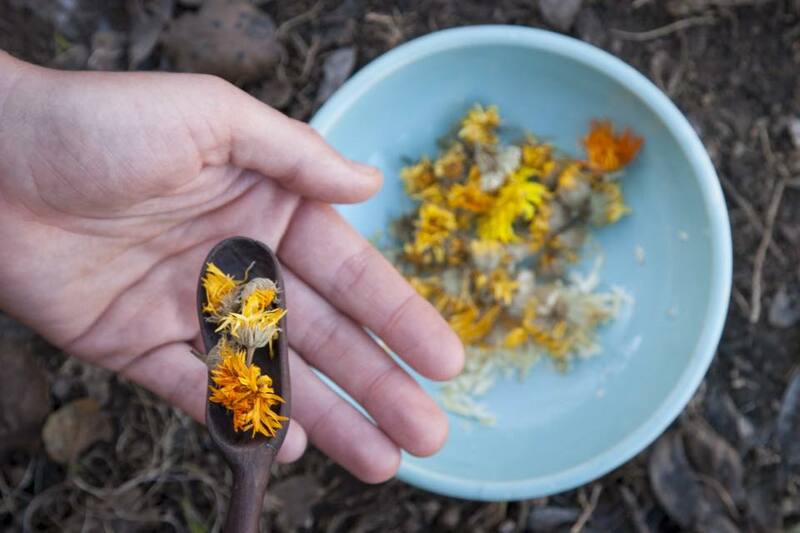 If I am dealing with a skin issue, calendula is one of my go-to herbs. Even minor irrationals such as tomatoes rashes, or even your baby’s Diaper Rash. This affinity for the sun shows us that calendula embodies certain qualities. It shines light and warmth where it is needed. Energetically, it is warm and both dry and moisturizing (being neutral in regards to moisture). Therefore, calendula has a special use for swollen, hot, painful and pus-filled tissue. Great for Blemishes and old Scaring. Generally, the flowers are recommended for use, though I’ve experienced medicinal properties in the leaves as well. If you can grow calendula, investigate the leaves. They are resinous and almost sticky in texture and have a strong aroma, indicating that they hold valuable medicine. This salve can be used on the flowing: It has antiseptic, antibacterial and antiviral properties making it ideal for cuts, wounds and for healing piercings. Any other lacerations, hang nails, bedsores, irritated rashes will benefit from using calendula. It’s Great for prevention of Mosquito’s or on there bites. As always the herbs used have been all been proceed by my working hands. The beeswax is from five houses up my road. As written before: All very Local and There is loads of love in this medicine. Thank you for looking, be well! Thank you and supporting handmade.